How everything began. Before one could even think of surfing or windsurfing our predecessors on the far eastern islands of Polynesia practiced something, which is comparable with modern surfing. now a shaper on Fuerteventura. Find also an interview on waveman.cat (english). Manfred & Juergen Charchulla (the Charchulla Twins) are two icons of German windsurfing, who founded in 1973 in Bremen one of the first surf shops worldwide. The now live partly on the island Fehmarn (Baltic Sea) and the Caribbean and have a small, but well known bar, a museum and windsurf and kite school on Fehmarn (wikipedia) (german). 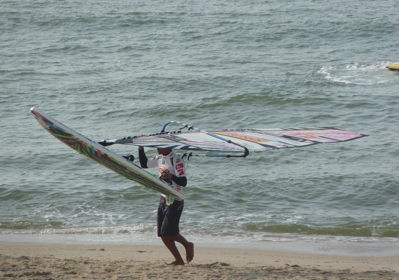 Below we have collected some information about surfboard design, sails, masts etc. and posted some links regarding the same topic. What distinguishes one (wind)surfboard from another are its specific characteristics. They influence the performance and feel of a board and are determined by the length and width of the board, the shape of the nose and tail, the rocker (curvature of the board), the rails (edges), the fins (single fin setup, twin, triple (thruster), quad etc. ), the bottom contour, the foil and the deck. Find out more about surfboard design and the different types (shortboards, longboards, funboards, fish, gun, hybrid, SUP) on surfscience.com, a page focused on surfing. The shape elements mentioned above are also relevant for most windsurfing boards, although they are modified to account for the fact, that a sail is used as well. Outline, width, volume, scoop-rocker-line, rails, bottom and tail determine the way a windsurf board performs and feels on your foot. Windsurfing boards range from the extreme narrow needle boards for record speed surfing to the wide racing boards, formular boards and the RS:X olympic class, which carry sails up to 12 sqm or even more. Board categories include wave, freewave, freestyle, freemove, freeride, freerace, race and certain boards catered for kids or beginners with a stabilising sword. Traditionally you would find only a single fin in most boards. However, twins, thruster and quads are now extremely popular for wave boards. A very comprehensive description of the different types of boards, suitability for different riders and design features can be found at windsurf-scout.de (german). Without a fin a surfboard would not work. The fin stabilises the board and enables it to move straight forward. The type of the fin will determine the drift and uplift of the board. For a raceboard one would need e.g. a long, straight fin, which allows early planning and limited drift (good uplift and limited drift), whereas for a freestyle board a short fin would be more suitable to allow sliding turns (more drift). Therefore each board category will require different types of fins. You are looking for a new sail ? This is even more difficult these days as numerous producers offer a broad range of gear and it is difficult to choose the right out of hundreds. What we experienced is, that it could really make sense to change all or at least several sails at the same time as you otherwise could end up with a collection of ‘overlapping’ sails and lots of different masts. This could be even more costly, than changing all gear at the same time. Again sails are designed for different purposes and they basically mirror the board range. You will find light and versatile wave and freestyle sails, freemove, freestyle, slalom, racing or speed sails. The more powerful the sail, the more heavier it usually will be. A stronger material may be needed or cambers will be used to stabilize the profile of the sail and allow a better acceleration (esp. for slalom, race or speed sails). The weight of a sail is determined by the material used. Usually the choice of material is a trade-off between weight and durability. Monofilm, which used to be the most popular material is (depening on its thickness) a quite light fabric. However, it is not very durable, so that it is usually used only for parts of the sail surface to allow a certain transparency of the sail. Thus modern sails are made of a combination of different materials like dacron, x-ply etc. which are basically monofilms with threads of kevlar or similar fabrics woven into the material. This enhances the durability against pressure or tension. In general sails are made of different pieces (usually of a triangular or bend shape), which are sewed together. A number of batten (usually 3-5) will stabilize the sail horizontally and a mast will be fitted into a curved mast bag on the front of the sail. Once you rigg the sail by pulling down the downhaul and applying some tension on the outhaul, the sail will bend and build out its specific form. How a sail behaves will be determined amongst others by the overall size, its weight, the material used, the general cut, the outline, the width (and therefore the length of the boom to be used), the length (and the mast to be used), the number of battens and cambers (if any). 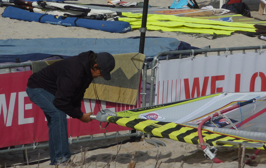 The crew from windsurf scout recommends the following range of sail sizes for a 75kg windsurfer (in sqm): 4.2, 5.2, 6.3. I (70 kg) would agree as I currently use similar sail sizes of 4.2, 5.0, (5.4) (wave), 6.0 (freestyle), (6.4) (freeride) on a 80l Fanatic Bee wave board (old one) and a Tabou 3S 97l Freestyle Wave. The 6.0/6.4 allows me to plane at constant strong 3 bft to lower 4 bft. Booms are available in different length, diameter (thinner, thicker, oval shape), stiffness and as aluminium or carbon booms. The longer the boom the more difficult to handle in carved manoeuvres. To find the perfect mast for your sail used to be easier in the old days. If you browse through your local store or pages on the internet you will find lots of different mast types: the standard SDM (standard diameter mast), the RDM (reduced diameter mast, also called skinny or needle), some hybrids (e.g. North SDM with a standard base diameter and a thinner diameter towards the middle and top (so called drop shape)), different length (370 cm up to 550 cm), masts with more or less carbon (30%, 50%, 60%, 75%, 90%, 100% (the more carbon the lighter the mast, but also the more expensive), with different bend and stiffness characteristics (usually measured in accordance with the IMCS system (indexed mast check system) (e.g. 19, 21 or 25 etc.)) and different bend curves (hard top, constant curve, flex top etc. ), which describe the way the mast will bend in its different sections (top, middle, base) under tension. I finally found a Tushingham 400/19, which works quite well now, but since then I became extremely careful to mix sails and masts of different brands. However, the example shows, that even if you stick with one producer, you may not get the perfect result.